I had the idea of getting some of my nearest and dearest to write a guest post each week. This month I've asked Rich to share what's in his bag. He is a total geek so, needless to say, his bag bears all the hallmarks of a complete, utter computer geek! 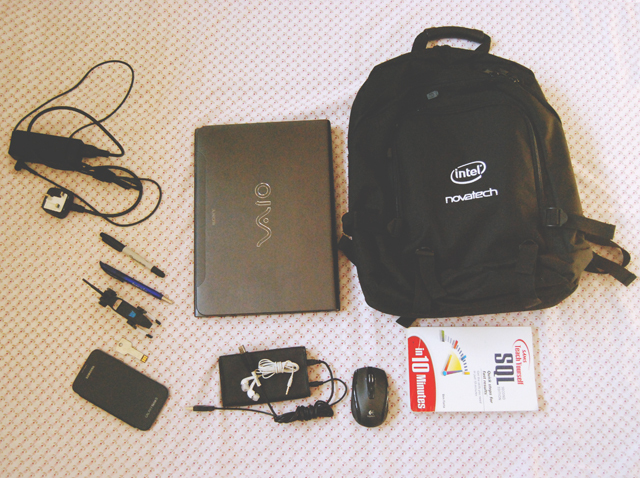 My bag was provided by Novatech, one of the PC suppliers my workplace use. We have a great relationship with them, and on a recent visit by our account manager we were given a truckload of freebies - bags, netbook cases, pens, mousepads and the like. Comfortable, supportive and with a proper laptop compartment- Perfect for me! This is my equivalent to a £3000 Prada bag: My pride and joy, my baby. A 14" Sony Vaio with a touchscreen. I won't bore you with the real specifications (although any geeks reading would want to see, I'm sure) but, suffice to say, it can take anything I throw at it and has had the components modified to boot. I live with this machine by my side at home and at work, so it needs to do the job - and does so with aplomb. Because a touchpad, touchscreen and fat fingers just don't cut it sometimes. The battery life on the Vaio is alright, but can't get me through a full working day, so my charger goes everywhere with my laptop. Samsung Galaxy Note II. Bigger than most people are happy with for a handset but personally I love the size of the screen for watching video, and the stylus note-taking facilities are the cherry on the Belgian bun. 500 GB for backup storage and the various software installation packages I use on a daily basis. You can't see it in the case, but over the years I've covered the chassis in badges and stickers from different computer components. The database administrator's bible. Part of my job incorporates Information Systems Management, something I've never done before. You've got to learn somehow, I guess...! For day-to-day passing of large files around the office and/or installation of apps to desktop computers around my workplace. Sharpie for writing labels on CDs or DVDs I've burnt, and a proper old school analogue pen for when there are just no digital options available. Every geek has to have a toy! He is a loser haha! Luckily he's very responsible haha! Typical man bag! I love you're spin on it though. Getting a man to do a typical whats in your bag post is such a great idea. He kept nagging me until I published it haha! I hasten to add the laptop didn't actually cost £3000! Hahaha, that 'Becky note'! Great! And although (or maybe because) it was different than usual what's in my bag posts from bloggers, I enjoyed this. It is so funny how you can see a bit of a persons personality by what he/she is carrying around.